On Thursday, July 13th at 11:55 PM, Air China is going to be having a sale on their flights from Vancouver to Bangkok, Thailand for $499 CAD roundtrip including taxes. There will also be fares from Vancouver to Shanghai, Guangzhou, and Qingdao, China for the same price. As well as fares from Vancouver to Manila, Philippines - like they had the last time around with a similar sale. But with so many low fares to mainland China these days, it's really the fares to SE Asia (Thailand and the Philippines) that jump out as a great price. Air China's flights have a stop in Beijing, China each way. NOTE: Air China usually releases theses fares around 11:55 PM PST. You can try starting with this Kayak search, and then adjusting it to the dates you're thinking of trying on the Air China website at midnight tonight. It *could* be indication of which dates will actually be available, and the layover times (but not guaranteed). Hopefully they really are the flights with 3 hour connections in Beijing which would be fairly fast flights for YVR to Bangkok. The info below is just speculation on what *might* become available at midnight tonight, based on what Kayak is showing. September: lots of dates in the first half, up to September 21. A few in the second half: Sep 18 to 20, 21, 21 to Oct 4. October: Just seeing Oct 1 to Oct 15, 16, 17, 18, 21. Not seeing any in the second half. November: not seeing any in the first half, unless you depart on October 31, returning Nov 5, 6, 7, 8, 9, 10, 11. The second half has more. December: You can find fares up to December 13th. There won't be any return dates in December past that point. Christmas will be off limits as always, unfortunately. May: The latest you can return looks to be May 19, 2018. Update 7/14 @ 10 AM PST - The following dates are still working this morning for 2 passengers to Bangkok, Thailand. (all other date ranges besides the ones below seem to be sold out, or there might be single seats left, I only checked for 2 or more). The links below will take you to a search on Kayak for 2 passengers. Click through from there to the Air China website. The total shown on the Air China website will be for 2 people. For longer trips you can try mixing and matching the departure and return dates from the dates you found on Kayak or the list below, and running another search on Kayak. The maximum trip length is 3 months. vancouver, yvr, flight deals, asia, east asia, china, guangzhou, can, shanghai, pvg, bangkok, thailand, bkk, southeast asia, air china, tao, qingdao, manila, philippines and mnl. 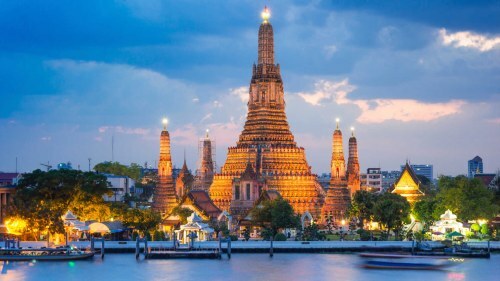 31 Responses to "Vancouver to Bangkok, Thailand - $499 CAD roundtrip including taxes"
Do you know if this upcoming deal: Vancouver to Bangkok, Thailand - $499 CAD roundtrip including taxes include deals for business class?? Is it the same deal for back and forth china? Yes, there will also be fares from Vancouver to Shanghai, Guangzhou, and Qingdao, China for the same price ($499 CAD roundtrip including taxes). I saw at the button of this promotion says maximum stay is 3 months. If I want to stay longer than 3 months do you think it may worth it to book my ticket for 3 months and later call them and pay some penalty and extend my ticket. Or other option does it worth it that just buy return ticket and if I need to stay longer and no option to extend I forget about the return part and just buy another one-way ticket back to Canada. In general, are usually this kind of promotions only 3 months maximum stay? I find it's not usually worth it to pay the penalty to extend a ticket. The airlines generally charge a minimum of $200-$300 for changes *plus* the difference in fare cost between the price when you booked, and the price it is now, which can easily add another $300+. 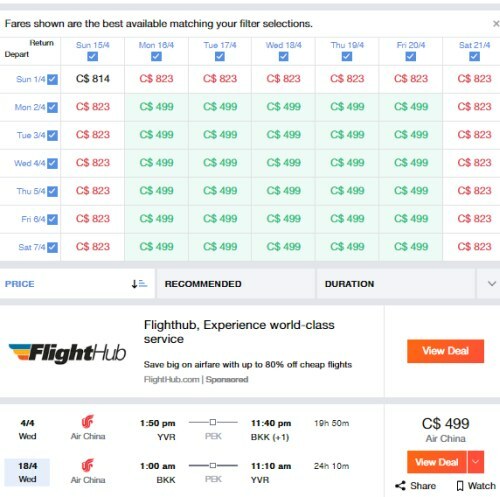 A one way from Thailand to Vancouver will probably cost a minimum of $650-700 CAD, so with a total cost of $1050 to $1100 for both flights, that may not be worth it either. How long is the sale on ? I cant book until Tuesday! The sale is technically until Sunday, July 16th - but realistically, like most airfare price drops, how long it actually lasts is a question of how much demand there is for the cheap fares, versus how many cheap fares the airline releases. It starts tonight, at 11:55 PM PST. 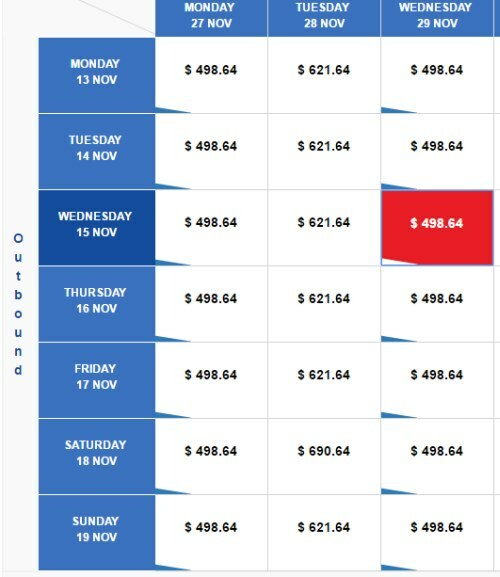 Do you think it'll be possible to get the $499 price for flights leaving on a Friday or saturday and returning on a Sunday? or will it be $499 only for midweek flights / returns? I seem to remember pretty much every date in the flexible calendar date view showing $499, so I think returns on weekend dates were available. But every sale can be different. 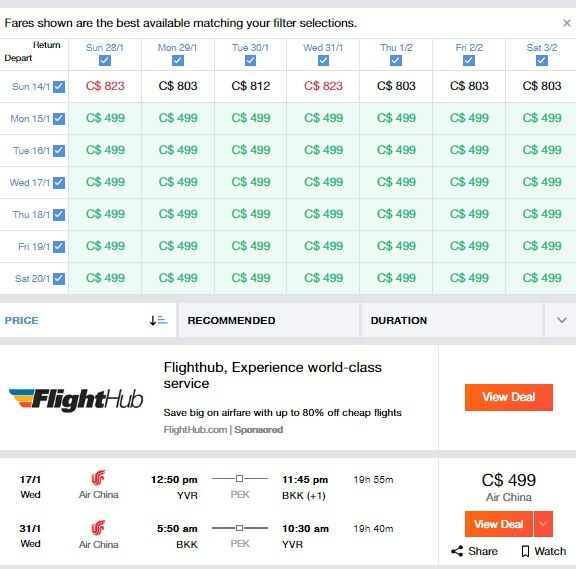 One thing is for sure, Air China has been a lot more generous with available dates from Vancouver than they have been from Montreal with their $499 sales. Their $499 flights from Montreal to Tokyo had only a handful of dates. This is amazing if I can actually find a flight tonight! Do you know if these are going to be direct from Vancouver or a lot of stops? We have been planning to go to Thailand for our honeymoon so couldn't be better! They'll be 1-stop flights via Beijing (all Air China flights route through Beijing). There aren't currently any airlines that fly non-stop from Vancouver to Bangkok. I've just posted an update in the blog post that might give an indication of which dates will be available, and a way to try your own dates to see. Seeing a lot of $499 tickets in March 2018 on Kayak, but when I process with the transaction it shoots up to $879, $242 on "surcharges". Is this normal? They aren't actually available yet, that's why the price is different once you click through. Kayak is displaying the prices that *should* become available on the Air China website in about 38 minutes (midnight PST). Air China probably loaded their fares into a distribution system that Kayak is picking up on (just a bit early). It's a good way to get an idea of what dates are likely to be available though, to prepare! Thanks Chris and YVR Deals. Just booked ours to Bangkok in September. We've been checking near every day for the past two months for a deal and then this came up! Chris , Fred indicated that he saw a max. stay of 3 months on the $499 return deal to BKK et al . Can you tell me where it gives this max. 3 month stay ? I cannot see at this point . Rather an important point for some folks , like me . But at this point, I don't think there's enough dates left to even test to see if that's true. March 7 or 8 to May 15-21 may still be working. They're showing up on Kayak at least. Thanks! All booked for a November holiday. Much appreciated! Thanks Chris! We booked the tickets to BKK for February 2018. If i purchase the ticket and have to cancel it if we can't go for work reason. Can we get a refund back or a credit? Frustrated. Set my alarm for midnight to book flights to Thailand in March. Couldn't find any of the $499 deals. Ugh. Hey Chris, awesome site thanks! Unfortunately we are going to have to book full price last few days of December... ive read your post on booking to Thailand, but, if you shook your pretend crystal ball around would you have any tips for me on booking today vs waiting it out? Unfortunately December 20 to January 7th is generally off limits as far as unusual price drops on any airline, to anywhere, at any time. Christmas is a powerful force! Hi Chris, thank you for the quick reply, I'll reply in kind by telling everyone about your site! The fact that drops are "generally off limits" is good enough for me to book now and stop having to check flights all the time! I was able to book a 3-months stay. Try Sept 20 to Dec 20. That's still working.